Neck: maple wood with truss rod ;. 5 x scale tone changer. ♬ Right-handed electric guitar with accessories is ideal for beginners and is ready to use out of the box. ♬ Features a sturdy top with fine arches, ideal for new, aspiring musicians and expert guitar heroes. ♬ This right-handed guitar is ideal for beginners and ready to use in the box.This Beginner Acoustic Guitar is Just the Ticket! Includes a case, guitar pick, pitch pipe, a shoulder strap, and an extra set of strings. 39" electric guitar. Type: Electric Guitar. Ideal acoustic guitar for beginners. Wonderful gift for your kids. body: platane solid wood. Color: Blue. Style: Modern. A nylon case is including for storage and easy transportation. You are just one guitar away from super rock star! Type: Electric Guitar. Glossy Finish & Sturdy Construction & Smooth Tone. Style: Modern. As an added bonus, there is a nylon case included for storage and easy carry. 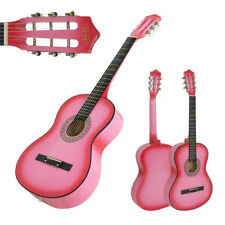 This mini electric guitar set has an attractive pink color and smooth finish. Type: Electric Guitar. Style: Modern. Color: Pink. - As an added bonus, there is a nylon case included for storage and easy carry. In my opinion Rondo Music has it all/does it all. Have a great July 4th! Edward Shaw Date: Mon, 19 Mar 2001. Acoustic Guitars. "I appreciate all the help that you and the staff of Rondo Music provided. 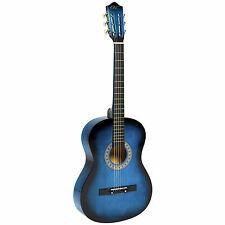 Spectrum 36” Acoustic Student Guitar. Condition is Used, but in excellent condition. 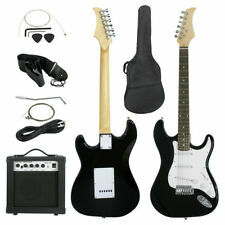 This mini electric guitar set has an attractive black color and smooth finish. Type: Electric Guitar. Style: Modern. - As an added bonus, there is a nylon case included for storage and easy carry. 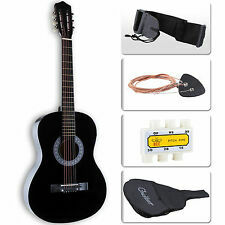 Best Choice Products 41in Full Size Beginner Acoustic Cutaway Guitar Set w/ Case, Strap, Capo, Strings, Tuner - Black. BCP SKU: SKY5048. Learn to jam like the pros do with an acoustic guitar set perfect for beginning and experienced musicians. Type: Electric Guitar. Ideal acoustic guitar for beginners. body：platane solid wood. Color: Blue. Style: Modern. A nylon case is including for storage and easy transportation. 1 x nylon case. 1 x 15w-AMP 1 x set of extra strings. 1x Ukulele. 1 x Tuner(Without battery). Guitar Strings Material: Nylon string. 1x Carrying Bag. Size: 53 x 17 x 5cm/20.8”x6.69”x1.96”. We will try our best to reduce the risk of the custom duties. Oil Paint: Matte Eco-friendly Paint. ♬ This right-handed guitar is ideal for beginners and ready to use in the box.This Beginner Acoustic Guitar is Just the Ticket! ♬ 【Easy Use】 - The body features a 19 fret fingerboard and an easy to use tuner,with a sturdy top with fine arches. Trending at $35.45eBay determines this price through a machine learned model of the product's sale prices within the last 90 days. 【Great Gfit for Kids】 - It is lightweight and easy to carry. 30” scale is easier for small hands to manage.Good quality, beautiful surface especially the perfect size make it an ideal choice for your kids. 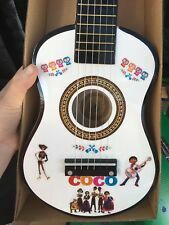 • Children will love this Coco guitar. • P erfect gift item! What an amazing deal on a small-bodied starter acoustic guitar! Pitch Pipe Tuner. Guitar Features 3 Guitar Picks. Extra High E String. Other Information. Water Sports. Geared Tuning. 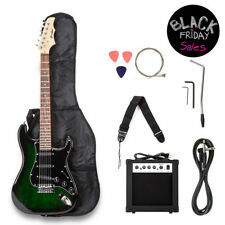 This mini electric guitar set has an attractiveblack color and smooth finish. Type: Electric Guitar. Style: Modern. - As an added bonus, there is a nylon case included for storage and easy carry. Color: Black. Condition is Used. The guitar was tested and works perfectly was taken good care of. A great way to buy a quality affordable full size electric bass guitar. The electronics work and the bass is playable. FULL SIZE ELECTRIC BASS GUITAR. Full Size 45" Electric Bass Guitar. Bass Features. •20W amplifier. 20W Amplifier. • Tuning item: chromatic, guitar, bass, violin, ukulele. Complete with headphone jack and overdrive, you’ll get great quality sound. • Power: 20W. •Full-size 39" electric guitar. 1 x Plectrum. Play your favorite tunes with practice and dedication on this 21" Acoustic Guitar Pick String! It is a reasonably priced, entry-level acoustic guitar. The wood top, back and sides also keep the guitar lightweight and inexpensive while not sacrificing tone. Included: Electric Guitar, Amplifier, Shoulder Strap, Case, Extra Strings, Pick and Cord. Kids 6-String 30" Pink Electric Guitar Kit. WHAT YOU SEE IN THE PICTURE(S) ABOVE IS WHAT YOU WILL GET. The Fender CC-60S boasts upgraded features at an attractive price, including a solid spruce top, rolled fingerboard edges and an ‘Easy-to-Play’ neck shape. The CC-60S is an entry-level Classic Design model, and features mahogany back and sides and a rosewood fretboard. Maple Neck with Truss Rod. The perfect way for anyone start playing the guitar at a great price! Check outmore great guitar models, drums and much more at amazingly. 39. 5 " Full Scale Overall Length. You are just one guitar away from super rock star! Type: Electric Guitar. Glossy Finish & Sturdy Construction & Smooth Tone. Style: Modern. Product Size: 39’’. A sturdy top with technical rosewood,a platane solid wood body and maple fretboard. First Act Guitar Amplifier and Microphone, both with light use. The amplifier is the MA104 model and requires a DC 14V adaptor (not included). For being so small, this amplifier can create great sound with adjustable volume, gain, and tone. There is only minimal ware on some of the corners. The microphone is a MVM-88 Unidirectional Dynamic Microphone, also made by First Act and comes with a long cord. Aside from some of the paint wearing away, it is also in great shape. The cord is removable so it can be used with other items. Though the amplifier is intended for an electric guitar, the microphone works perfectly with it. The short-scale Stratocaster (24") is ideal for players with smaller hands and provides a comfortable playing feel. Austin Bazaar is an authorized Squier dealer. Short-scale 24" Stratocaster is great for smaller hands. 84 chord combinations. 36 soft touch buttons. our error. We are not an authorized dealer of this product and any warranty included with the product may not be honored by the manufacturer. Condition: New. Whether it's just to be cool or to get your emotions out, there are so many reasons to start playing guitar. Finally there's an affordable option to start creating your own songs & strum along with your favorite artists. First Act Discovery Acoustic Guitar FG182. Condition is Used. Shipped with USPS Priority Mail. Neck: maple wood with truss rod ;. 5 x scale tone changer. 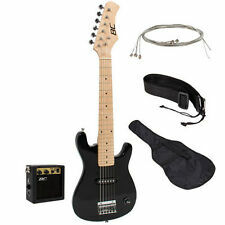 ♬ Right-handed electric guitar with accessories is ideal for beginners and is ready to use out of the box. This Full Size Electric Guitar is Just the Ticket! 1 x Plectrum. Play your favorite tunes with practice and dedication on this 25" Acoustic Guitar Pick String! It is a reasonably priced, entry-level acoustic guitar. The wood top, back and sides also keep the guitar lightweight and inexpensive while not sacrificing tone. A great way to buy a quality affordable full size electric bass guitar. The electronics work and the bass is playable. Full Size 45" Electric Bass Guitar. FULL SIZE BASS GUITAR. Bass Features High Gloss Finish. 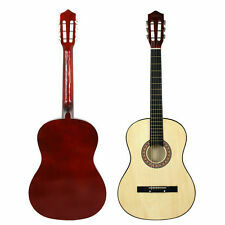 Guitar packages for beginners are collections of musical items budding players find useful. While a starter kit can contain an acoustic guitar or an electric guitar, a beginner guitar is almost always a six-string model. Other starter-pack items include a gig bag, tuner, and a guitar strap. An electric guitar is a string instrument that requires electrical power to make sound and has volume control to make the sound from the instrument louder or softer overall. Electric guitars can use nylon strings, which are gentle to the fingers when playing a chord without a pick. 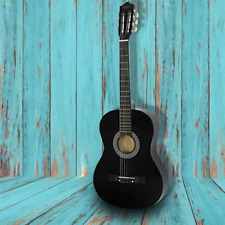 An acoustic guitar only requires the strum or pluck of the strings to generate sounds, and the technique of the player, how hard or how softly the strings are strummed, determines the volume. These guitars may use either steel or nylon strings. How do you select a starter guitar and kit? Selecting an instrument for a new guitarist can be a daunting prospect. This is particularly true if you have no musical background or are choosing a guitar for a beginner. The following guidelines will help simplify the process. Choose a musical style for beginning study. Since electric and acoustic instruments are featured in vastly different kinds of pieces, you should choose which style of music you wish to learn in advance. Let your ears guide your decision. Besides personal preference, an important and often overlooked consideration for beginners is practice space; if you live in an apartment building, playing an electric instrument will give you the option of listening to yourself through headphones rather than open air if you took the acoustic route. Take stock of your musical inventory. If you already play another instrument, you may have a tuner, strap, and other accessories in your home. Taking time to look through your stash can save you from redundancy. On the other hand, if you are purchasing your first instrument, you may wish to purchase a kit containing as many of these items as possible. Consult with a professional. If possible, get the advice of a music teacher, musician, or salesperson. Such persons can strum a chord or two and play on the fretboard so that you can get a sense of how an instrument sounds. They can go over the basics of a guitar, like identifying the fret marks and string names. In addition to providing lessons, string and school general instrumental teachers usually have quite a bit of experience in helping to choose a suitable first guitar.